In 1824, John Allen and Elisha Rumsey established the first homestead in what is now downtown Ann Arbor. The story goes that the community got its name when the two founders' wives, both named Ann, were seen lounging in a grove of trees. In reality, Ann Allen and Mary Ann Rumsey were never in town at the same time, but how it actually was named is unimportant when considering what Ann Arbor grew into. Early settlers gave the town schools, an expansive courthouse, a beautiful post office, and streetcar lines that spanned downtown. They built this town, and their legacy is present in every walk up Huron Street, drive down to William and Main Streets, or bike ride over to Kerrytown. Author Patti Smith has selected images that show a town with mud streets, wooden sidewalks, liveries, tanneries, electric lights, and telegraph offices. Included are stories about the first car dealership, various merchants, and early immigrants. 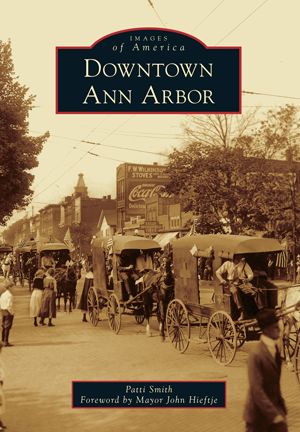 Ultimately a love letter to a beloved city, Images of America: Downtown Ann Arbor offers a glimpse into a not-so-distant past full of the people who built one of the most thriving downtowns in the state of Michigan.